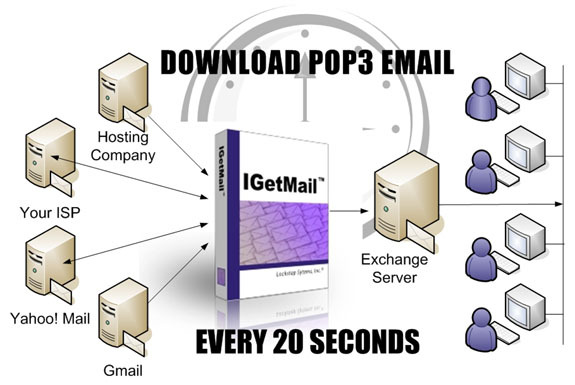 Powered by Lockstep Systems, Inc.
Use IGetMail to Automatically Download and Forward POP3 email to your primary SMTP account as fast as every 20 seconds! IGetMail is a Windows utility that automatically downloads POP3 email messages from remote servers and delivers your email to a single SMTP account. IGetMail Version 4.1 - Supports the TLS encryption protocol. When you have a Microsoft Exchange Server AND you are using an Internet Service Provider (ISP) to host your company’s Internet domain or website, you will experience an email routing problem. Your employees’ incoming email messages are sent to the ISP’s email servers; but Microsoft Exchange Server does not automatically fetch mail from remote servers. So, your messages are stored on your ISP’s servers until you pull the messages down. IGetMail solves this email routing problem for you. It automatically connects to the ISP, retrieves, and forwards email messages to your local Exchange Server. IGetMail runs according to a time schedule that you define - checking for mail as fast as every 20 seconds. Now your Exchange Server can complete its job and route your email accordingly. Does your company have more than one Internet domain? Maybe you have several and you need to download all the email sent to not just one, but several Internet domains. Or do you have users set up with individual accounts at third party email suppliers? You can use IGetMail to download this email that is stored on remote servers and have it automatically sent to your Exchange Server. IGetMail supports all versions of Exchange from Exchange 2000 and higher. IGetMail uses SMTP to send email to Exchange so it works with all versions of Exchange. What does IGetMail do for you? Checks for new emails at multiple remote servers as fast as every 20 seconds. IGetMail initiates connections with one or multiple remote servers to see if you have any new messages. You can define different schedules to check for new incoming email. IGetMail can pull email from multiple accounts simultaneously so you get your email fast. Downloads & stores your new email messages. When IGetMail finds new messages, it downloads them from the remote email servers. IGetMail stores a copy of these messages in order to deliver them immediately to your Exchange Server. And IGetMail can replay messages if your Exchange Server experiences any interruption in service. Sorts & sends new messages to your local SMTP / Exchange Server. IGetMail can sort the email before delivery to your local Exchange Server. This is important because Exchange Server requires that the messages be presorted. After sorting, IGetMail sends the messages to your Exchange Server which in turn, delivers them to the appropriate email accounts. Your incoming email stops and is held at your Hosting Company or ISP. Now you need to pull your email from the Hosting Company or ISP to your Exchange Server so it can be delivered to the correct recipients. When you use a Hosting Company to host your Internet Domain, all email addressed to your Internet Domain, goes to the company hosting your domain. IGetMail logs into your account at the hosting company and automatically pulls your email from the hosting company to your Exchange Server for distribution. Exchange Server does not login to other email servers to pull email, and as a result, you need a third-party tool such as IGetMail! Email Server refuses to Relay Email - or - Relay Denied Messages. Relaying is the process of sending email to an email server for which that server sends the mail on to another server. Since spammers have tried to find email servers that will forward email on their behalf (thus hiding or disguising their true identity), email server such as Exchange Server, use restrictions on relaying. Exchange considers anonymous connections as potential problems and as a result, Exchange may refuse to accept legitimate email if the email is sent to it anonymously. To solve this problem, Exchange provides authenticated SMTP login which provides trust between Exchange and the sender. IGetMail supports SMTP authentication so that it can be trusted by Exchange to send email to Exchange Servers. Experiencing email stoppage because you are using the SBS 2011 built-in POP connector? TRY IGETMAIL! IGetMail does not stop delivering email when a message is rejected by the Intelligent Message Filter (IMF). The SBS 2011 built-in POP3 connector stops pulling email when IMF rejects email. Use IGetMail to solve this problem with the built-in POP3 connector. Don't let your boss freak out because he/she is not getting their email! Install IGetMail today! on your Microsoft Exchange Server!